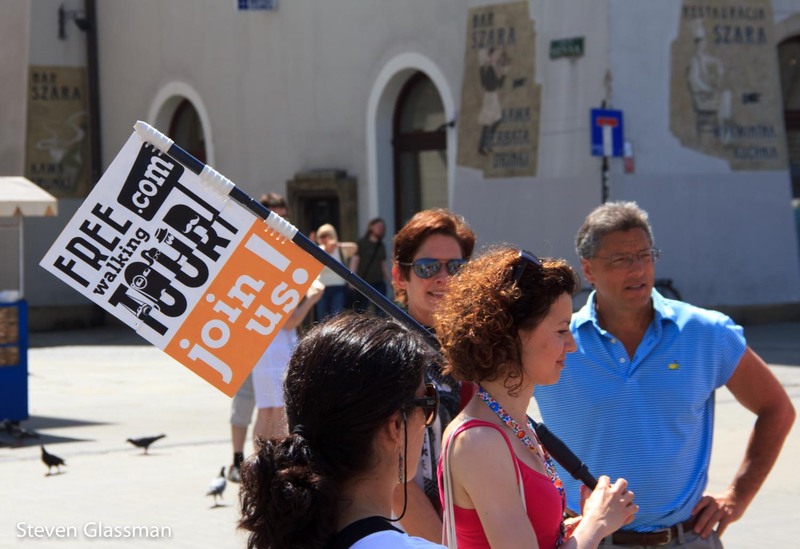 Poland – Sunshine. Whimsy. Tacos. 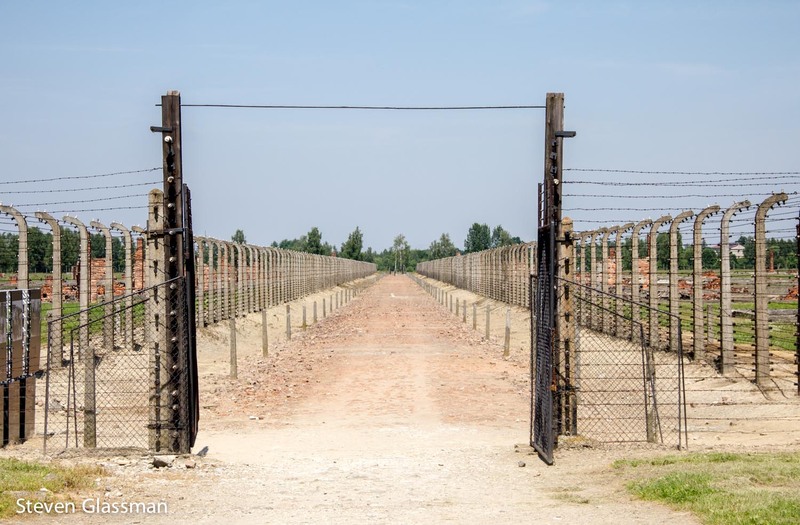 Note: The pictures in this post were taken at a Nazi concentration camp. If you are easily upset by this sort of thing, you might want to go look at something cute instead. I won’t judge you for ducking out on this post. 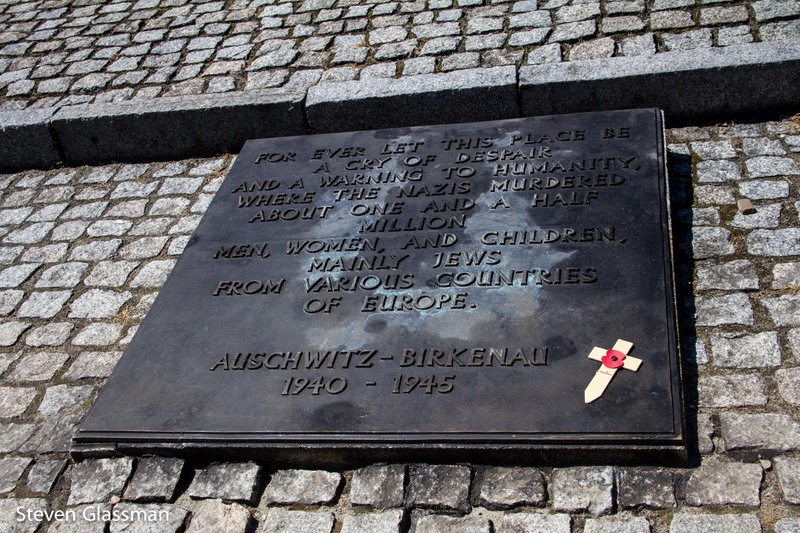 One more reason that I chose Krakow for my trip to Poland is the proximity of Krakow to Auschwitz and Birkenau. 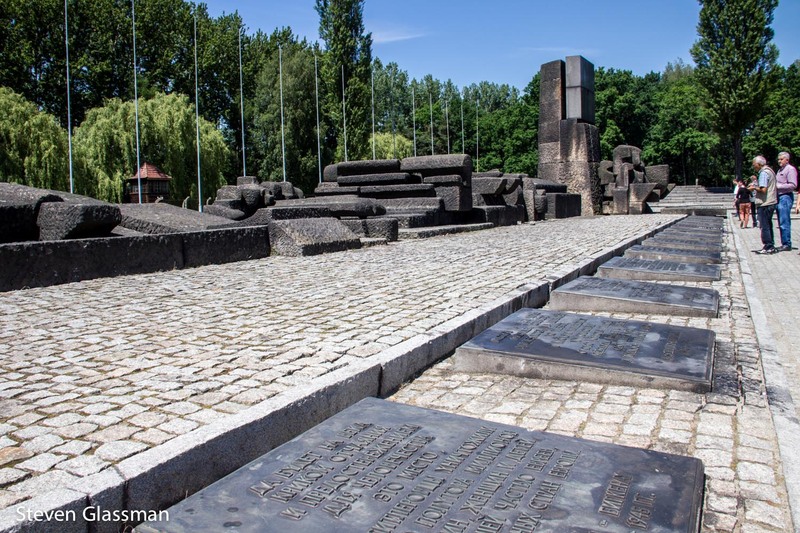 Memorials to the victims of the Holocaust are everywhere in Europe. I’ve seen many of them, and I’ve even been to one of the smaller concentration camps, Dachau near Munich. Auschwitz is on a different scale altogether than anything I’d previously seen. For one thing, it’s not one camp- it’s three. 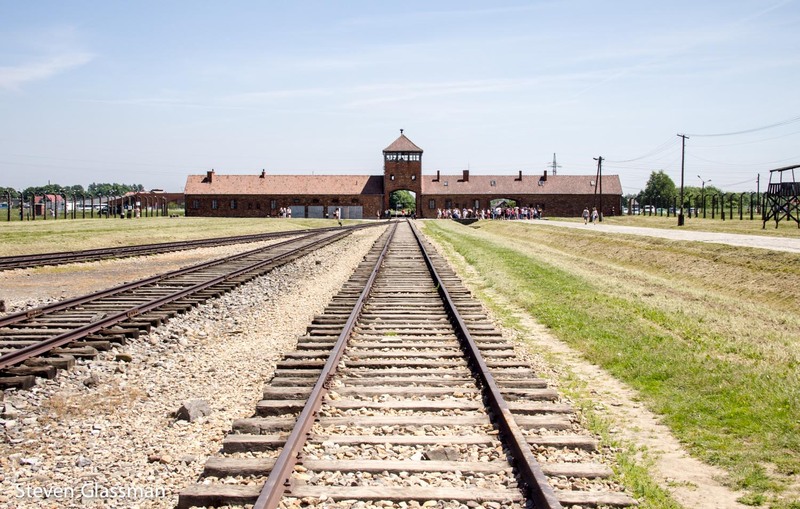 Some of these photos are from Auschwitz I, and some are from Auschwitz II-Birkenau. 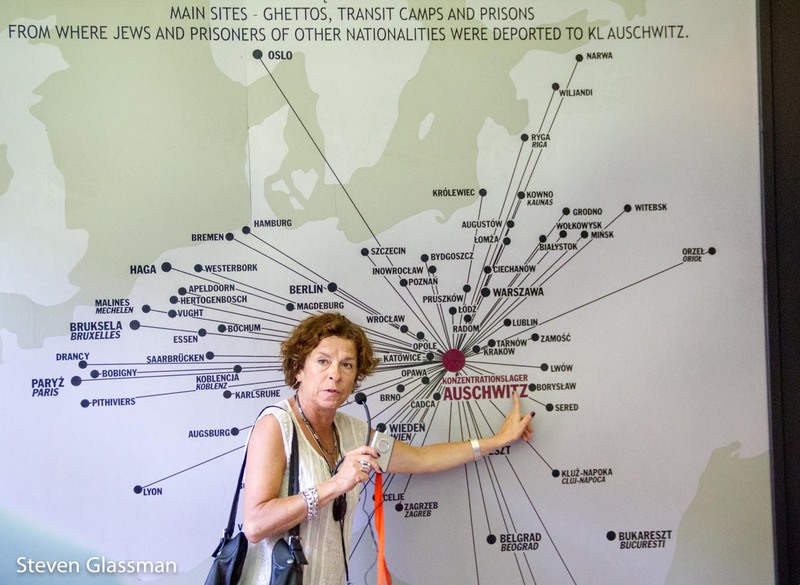 There is also an Auschwitz III, but I only visited I and II. 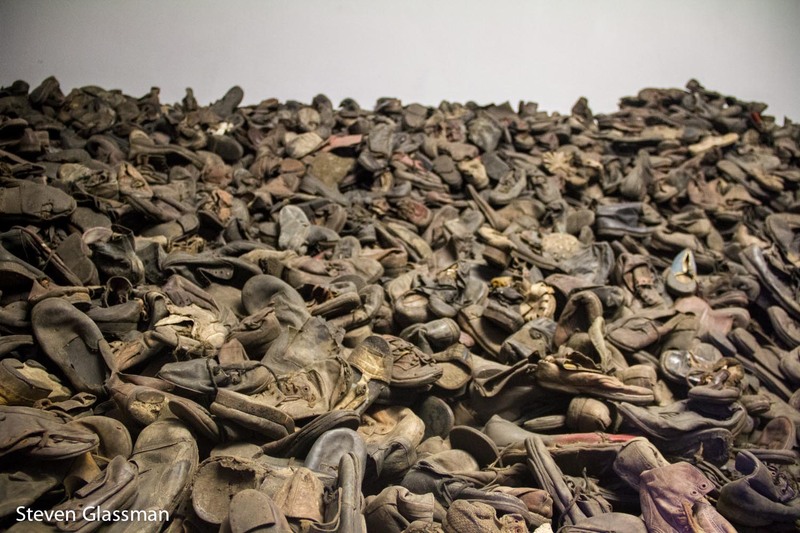 The Auschwitz camps killed an estimated 1.1 million people between 1940 and 1945. The current population of New York City is estimated at around 8.4 million people, so imagine New York City with an eighth of the people missing. That’s a lot of people. The entire camp is fenced in by a double ring of electrified barbed wire fence. 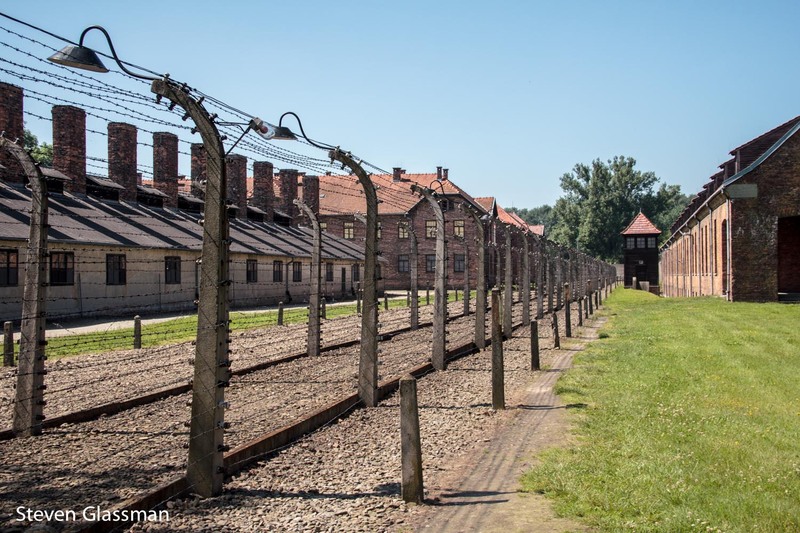 People were deported to Auschwitz from as far away as Oslo, Paris, and more. And by people, I mean Jews, Gypsies, homosexuals, and political prisoners. 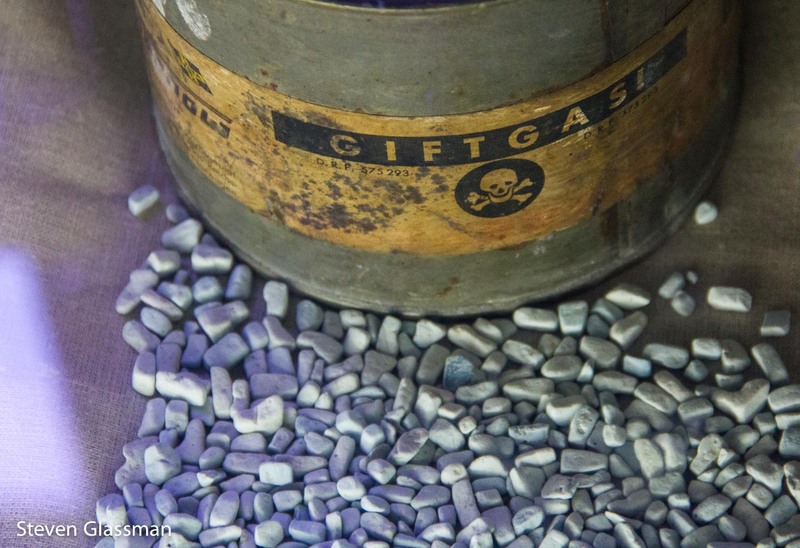 The prisoners of Auschwitz were killed with Zyklon B gas. 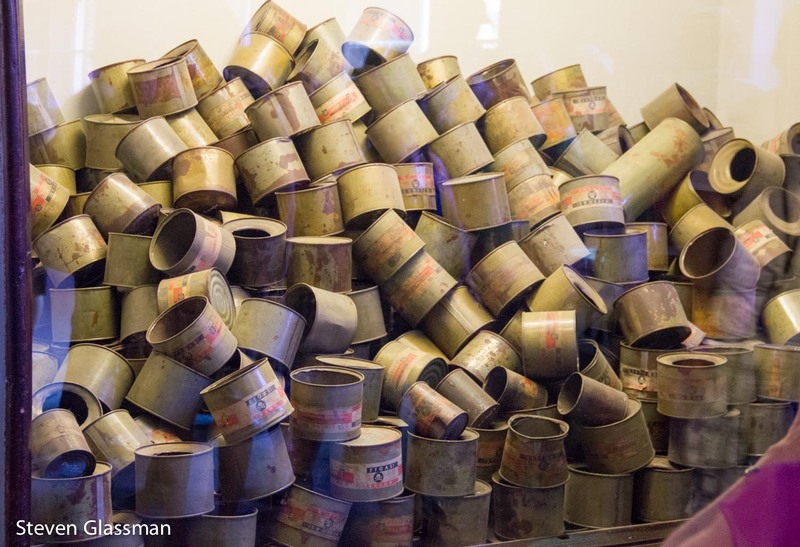 Empty canisters of Zyklon B found by the Allies at the end of the war are part of the exhibit now. A closer look at a Zyklon B canister, with absorbent granules. 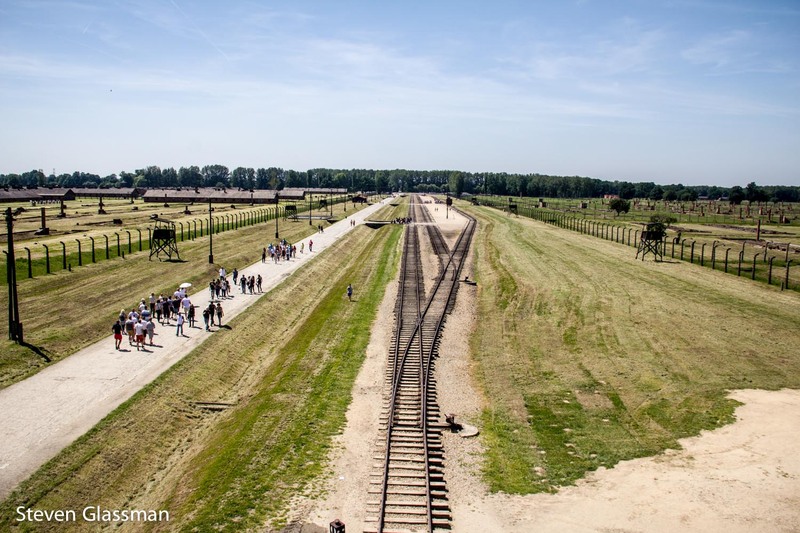 The trains carrying prisoners to Auschwitz II went straight through a central gate, to a platform in the center of the camp. The prisoners were packed into cars like this one. 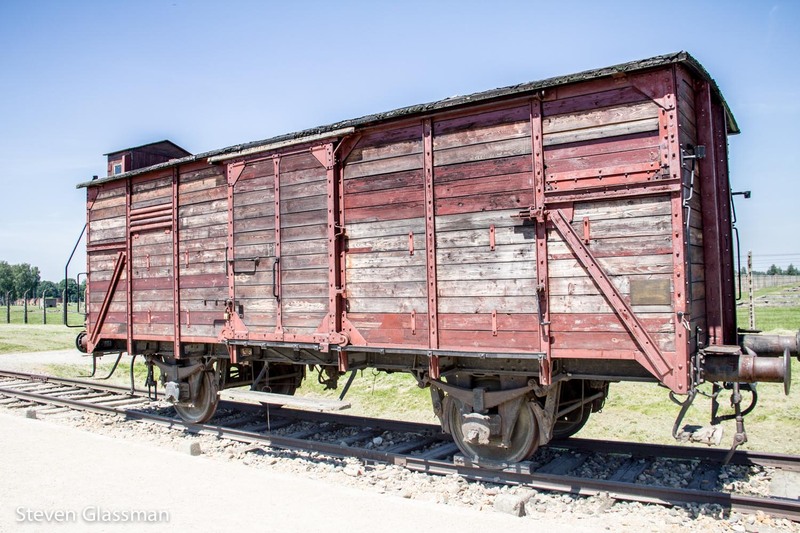 When the prisoners arrived, they were met at the train platform by an SS doctor who would determine immediately whether they were to be taken to a labor camp or taken to the gas chamber. This is the view from the tower over the main gate. 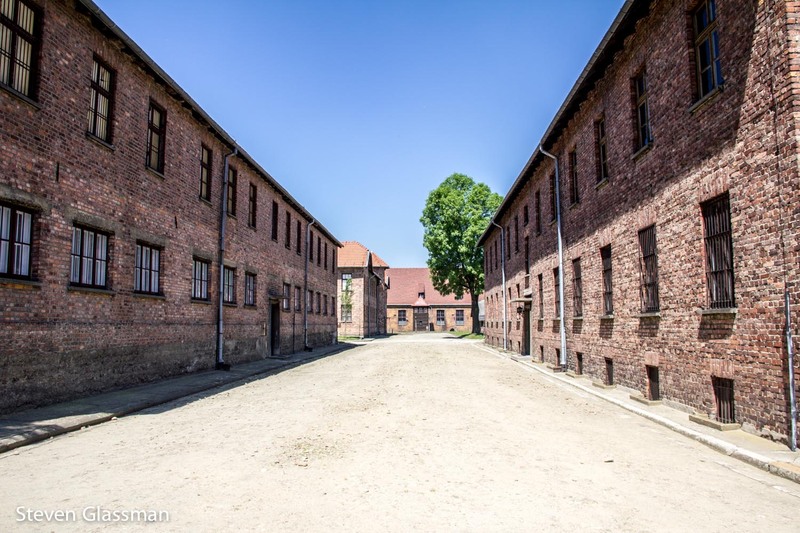 The left side is all barracks for the workers, and the right side leads toward crematoriums 4 and 5. The platform in the center is where prisoners were sorted as they came off the trains. Another high view of the barracks. This camp also had a special children’s barrack, where they were kept for medical experiments. Those who were too young, too weak, or otherwise incapable of labor were put to death immediately. 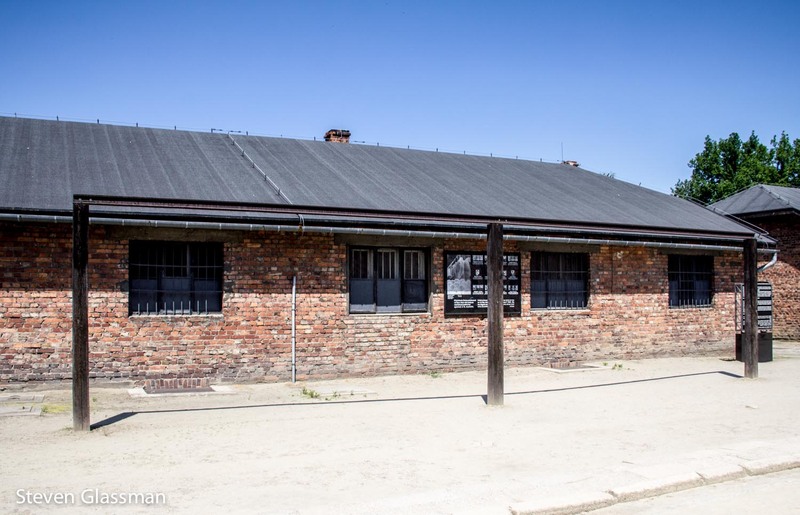 They were told that they would have a shower, so they were all stripped naked before moving into the gas chambers. This is some of the eyeglasses that were left behind. 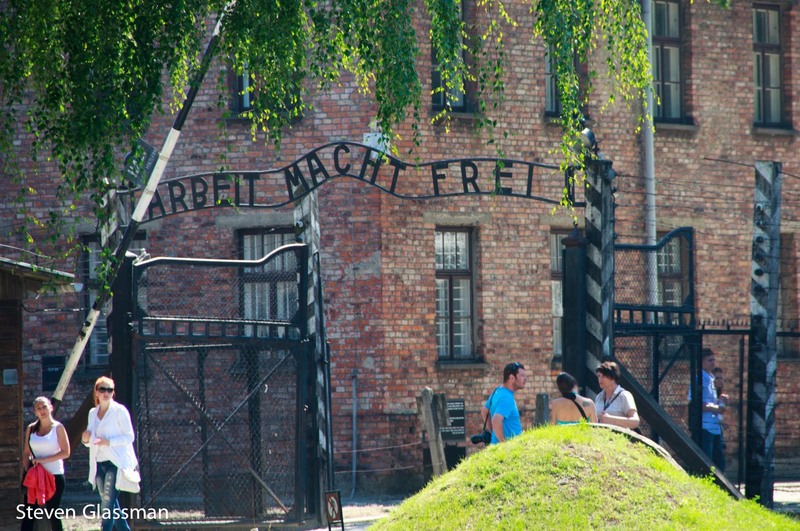 The people who arrived in Auschwitz had been told that they were being taken to a place where they could find work. They weren’t all aware of their fate. Because of this, they brought their most cherished possessions, thinking that they would be starting a new life. 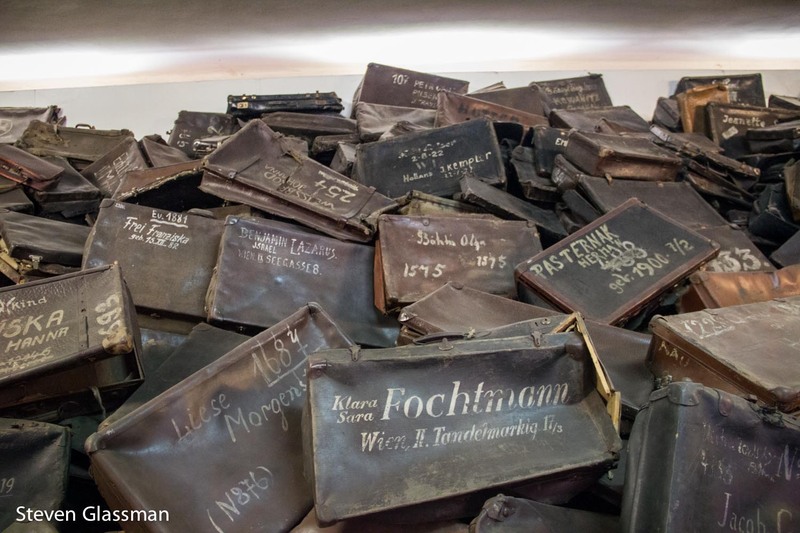 When they arrived in Auschwitz, their belongings remained on the train platforms while the prisoners either went to work or went to die. Nazi officers would then sort through the belongings for anything of value. Piles of empty suitcases were left behind. …and shoes. So many shoes. 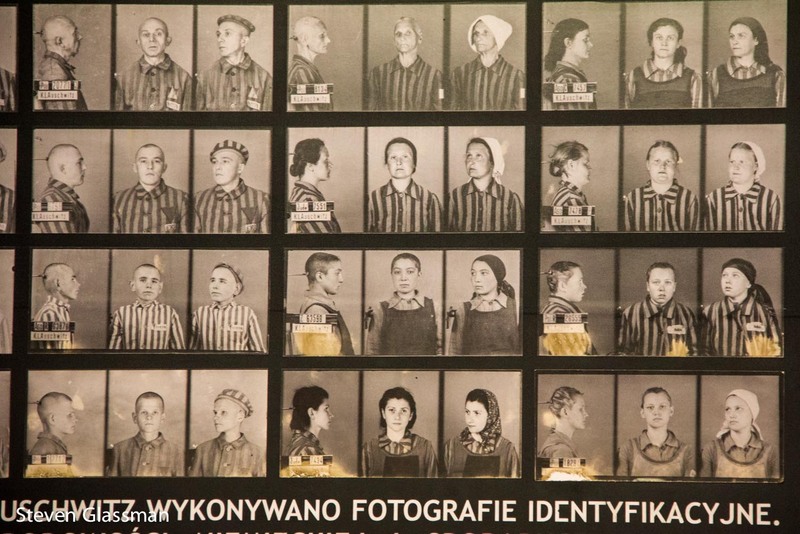 In the early days at Auschwitz, the prisoners were cataloged with sets of photographs like you see here. This procedure was not maintained for long, however- there were simply too many people in the camp. 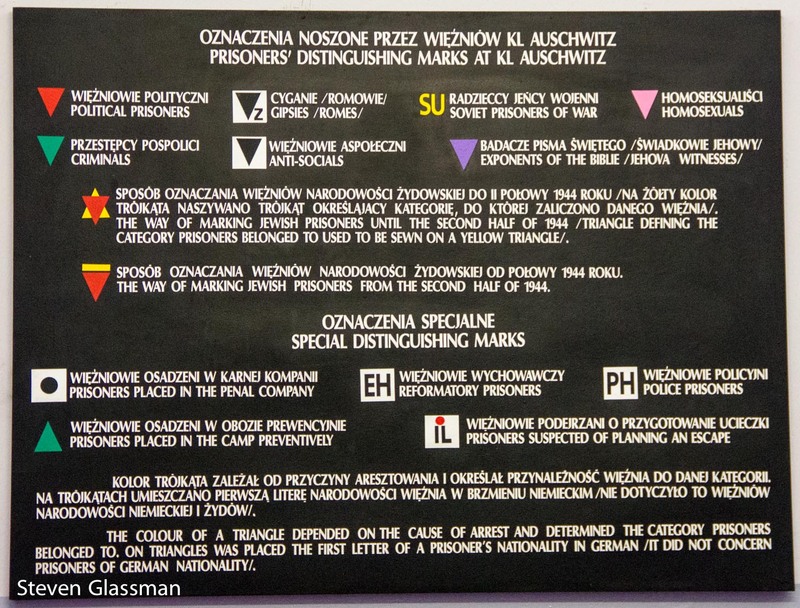 The Jewish star and the pink triangle are well known, but there were actually quite a few markers to designate why someone was in Auschwitz. 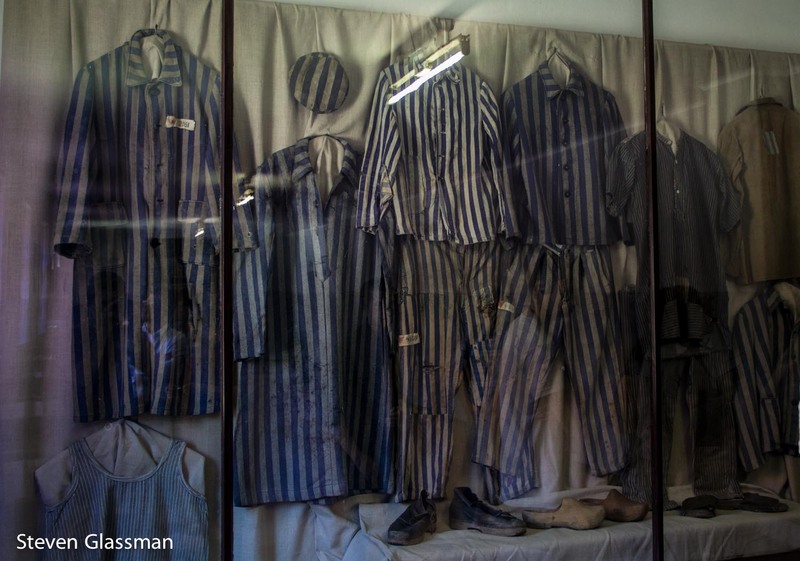 The infamous striped outfits worn by prisoners. Auschwitz I was actually converted from soldier’s barracks. 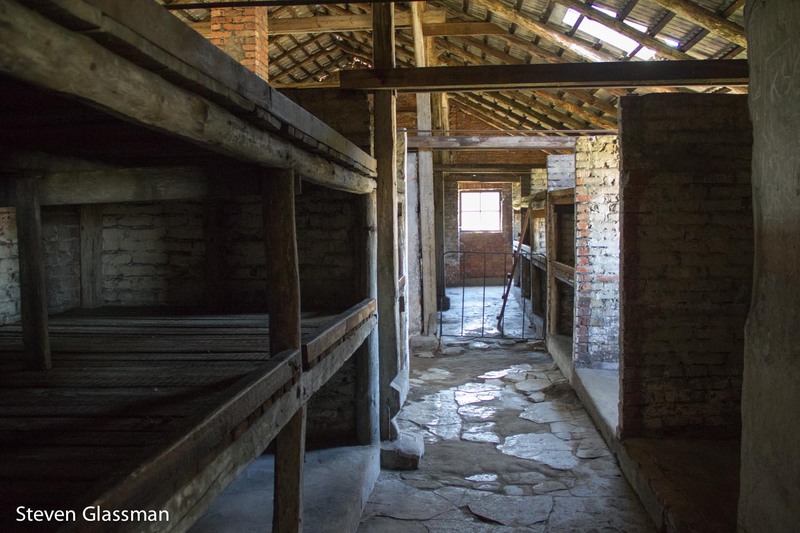 Auschwitz II was built by prisoners out of materials taken from nearby homes. 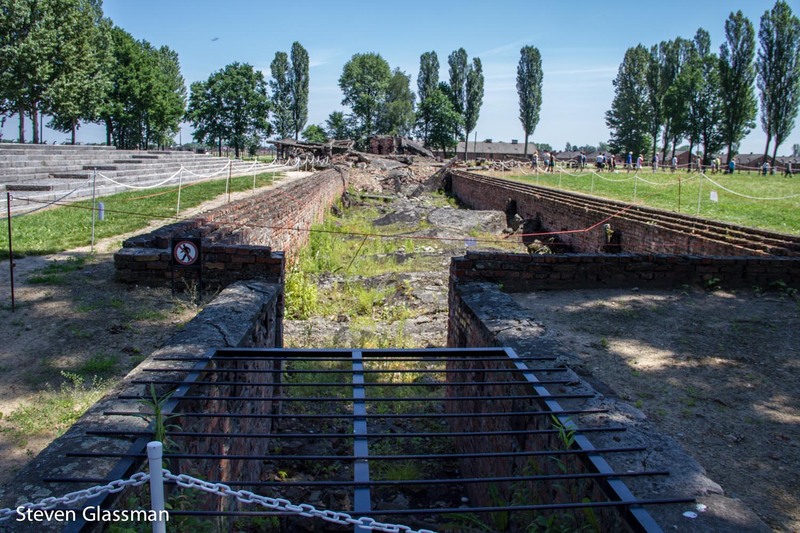 The prisoners walked the seven kilometers from Auschwitz I to Birkenau each day before they began to construct the buildings. 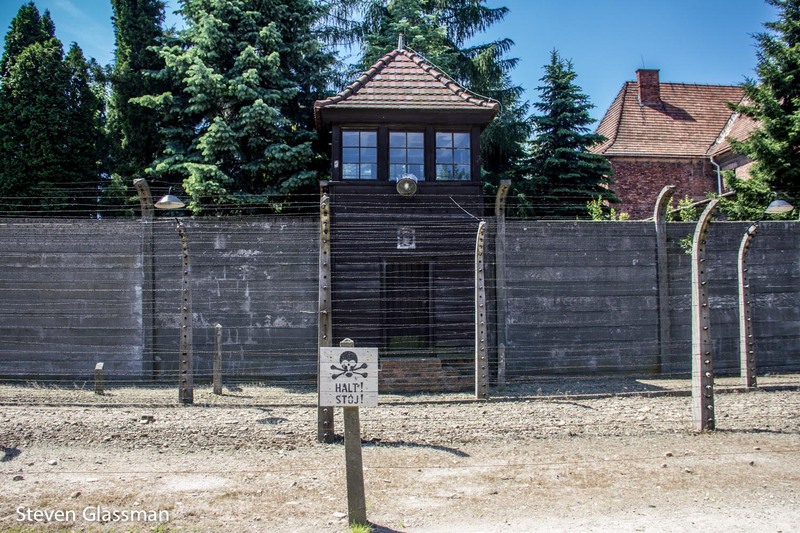 The razor wire was electrified, and even if you could get past that, the armed guards were in watchtowers at regular intervals along the fence. 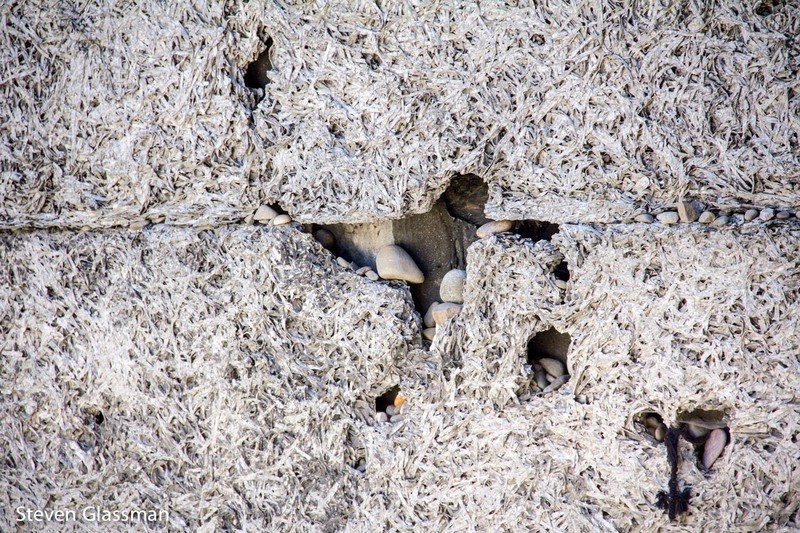 A wall where prisoners were routinely shot shows the stones placed by visiting Jewish mourners. 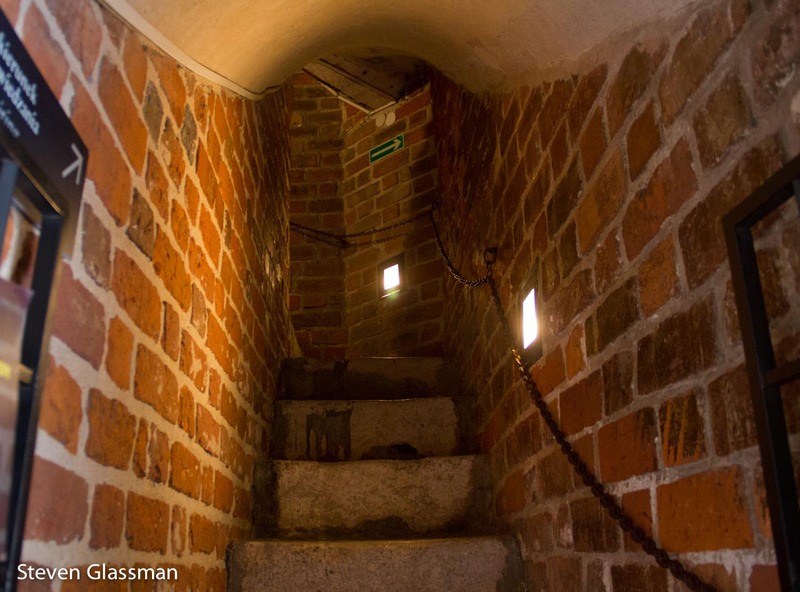 Whenever an escape was attempted, the soldiers would gather ten prisoners for a mass hanging here. The mess hall for German officers to dine had a happy little officer riding a beer barrel over the door. This is the ceiling of a gas chamber. False shower heads were installed to assist the lie that the prisoners were merely getting a shower before going to work. 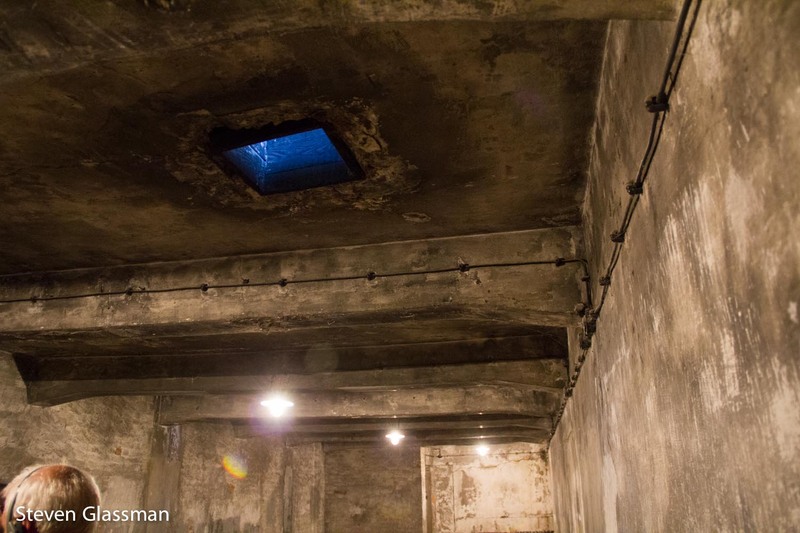 The slot in the top is where the Nazi soldiers, wearing gas masks, would drop in the Zyklon B canisters. Everyone in the room would be dead within ten or fifteen minutes. A longer view of one of the gas chambers. 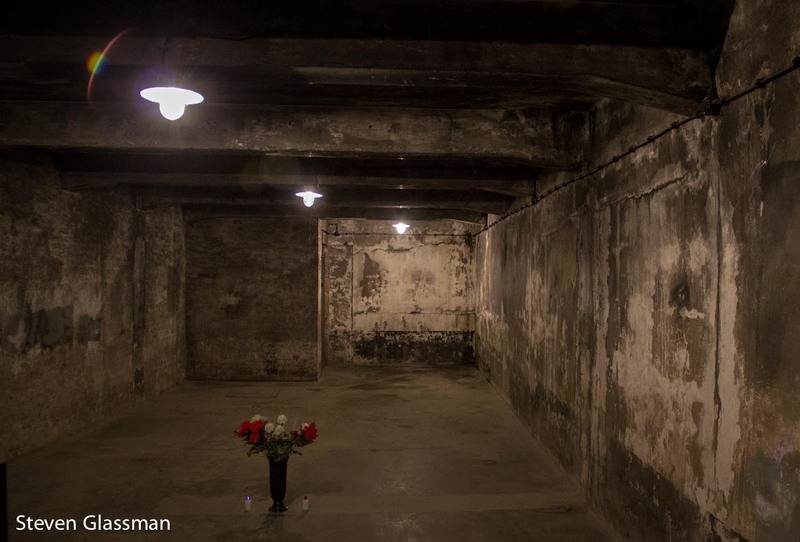 Auschwitz II had multiple gas chambers and crematoriums, although this particular crematorium was in Auschwitz I. 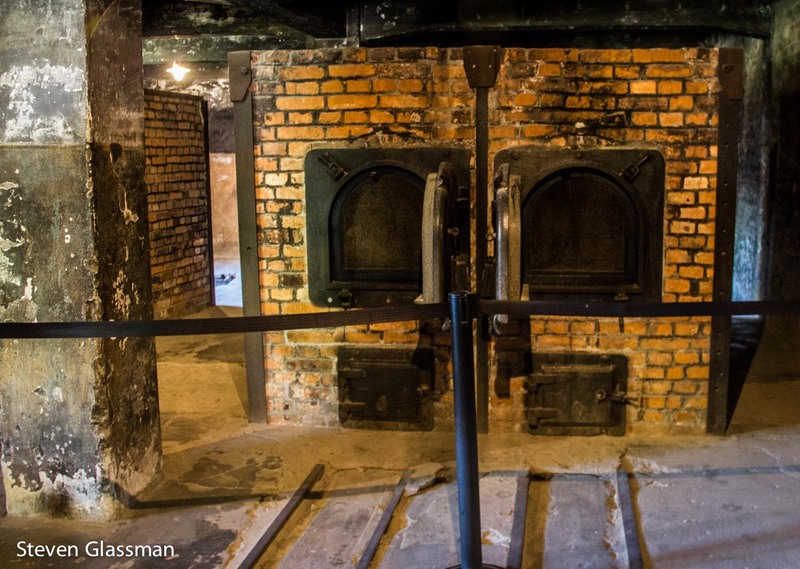 The metal tracks leading up to the mouth of each oven were installed to assist in the disposal of bodies. This pathway leads toward crematoriums 4 and 5. This is what remains of crematorium 2. When Soviet forces marching through Poland were almost to the camp, the Nazi soldiers set about bombing their gas chambers and crematoriums in an attempt to hide what was being done. 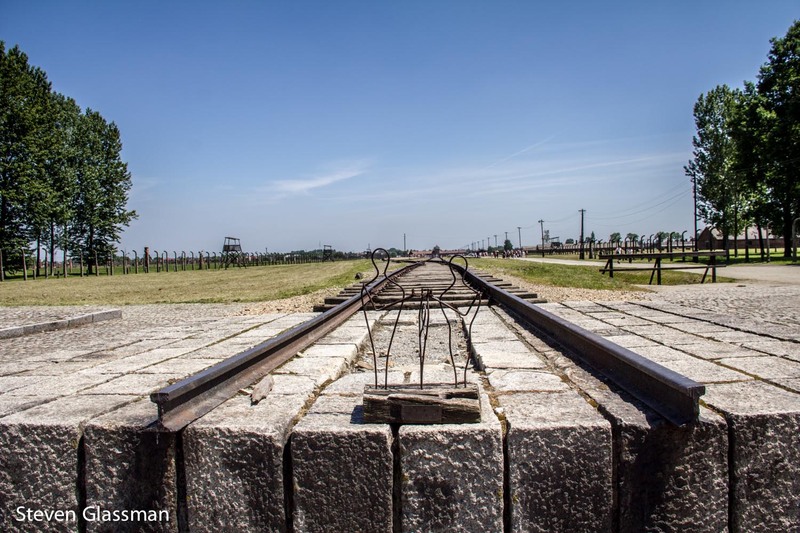 A tiny wire memorial stands at the very end of the Auschwitz II tracks. A larger sculptured memorial has also been erected in the camp, with signs in various languages. One plaque for each language. 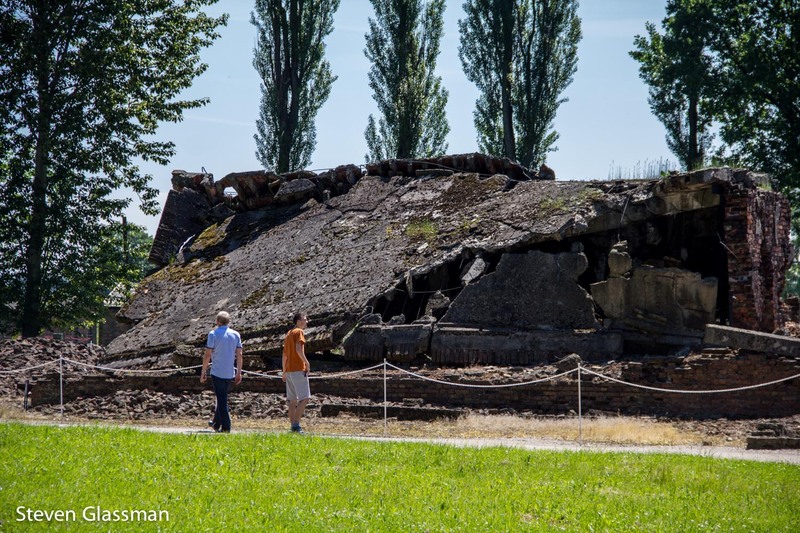 This is the bombed out ruin of a gas chamber and crematorium. The stairs directly in front of the photo lead into the underground gas chamber, which is now overgrown. The rubble at the end of the shot is where the crematorium stood. 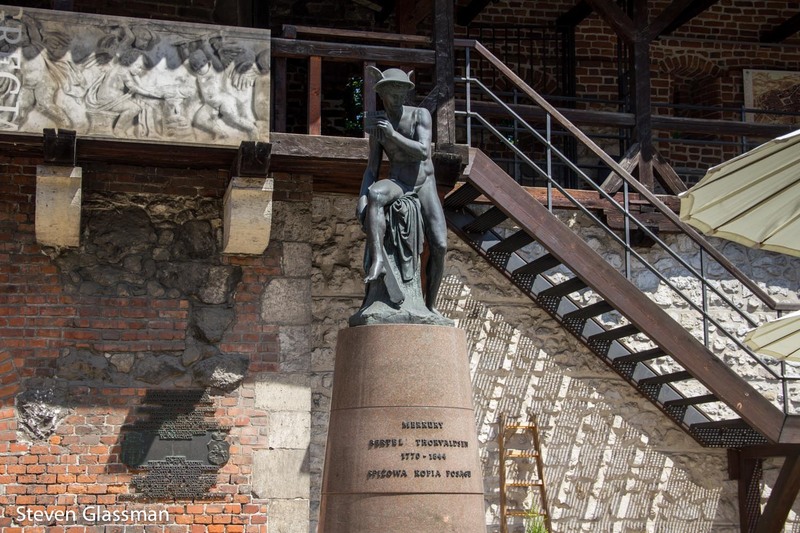 Those who survived Auschwitz only did so because they were able to work. One half of the camp was dedicated to barracks where prisoners were housed. 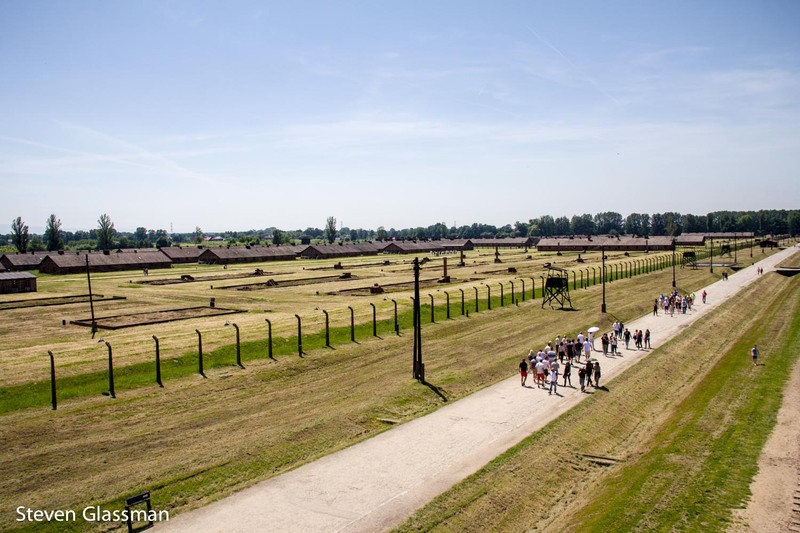 Depending on the barrack, there were between 550 and 750 prisoners in each structure. This post doesn’t even remotely capture the full horror of this experience. 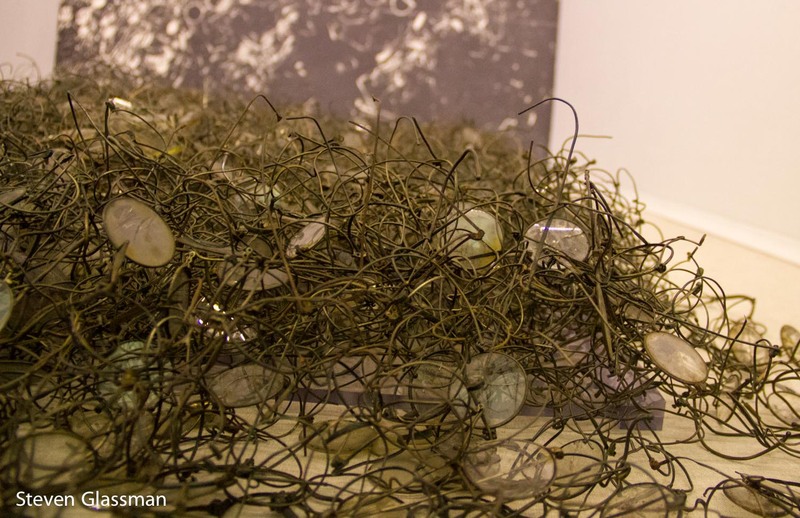 There were some things on display that I simply refused to photograph- I’m glad that I went to see Auschwitz, but I never want to see it again. If you got through all of this, why not go look at something cute to balance out the mood? After I took this tour, I certainly needed some cuteness. Have you ever been to Auschwitz? 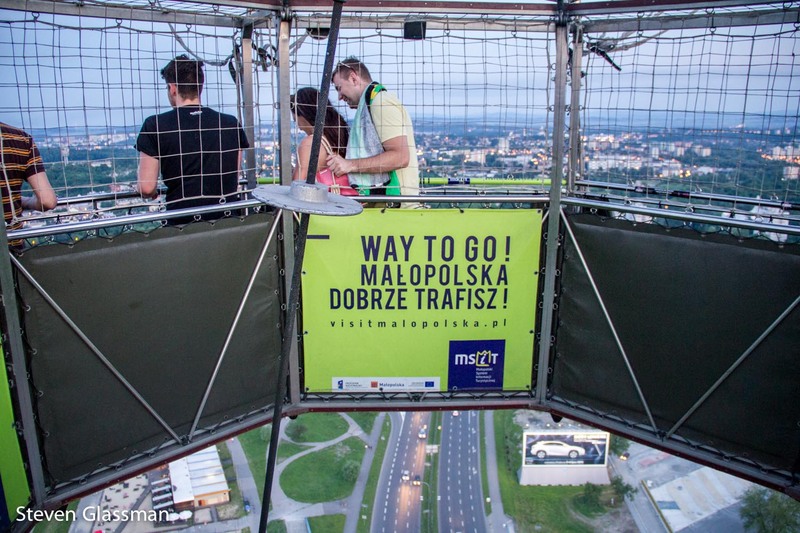 I knew early on that I needed to get to Poland at some point during my stay here. For one thing, I wanted to visit every country that borders Germany, and Poland was the last shared border country on that list. For another thing, my father’s father was born in Warsaw, so I’m partly Polish. 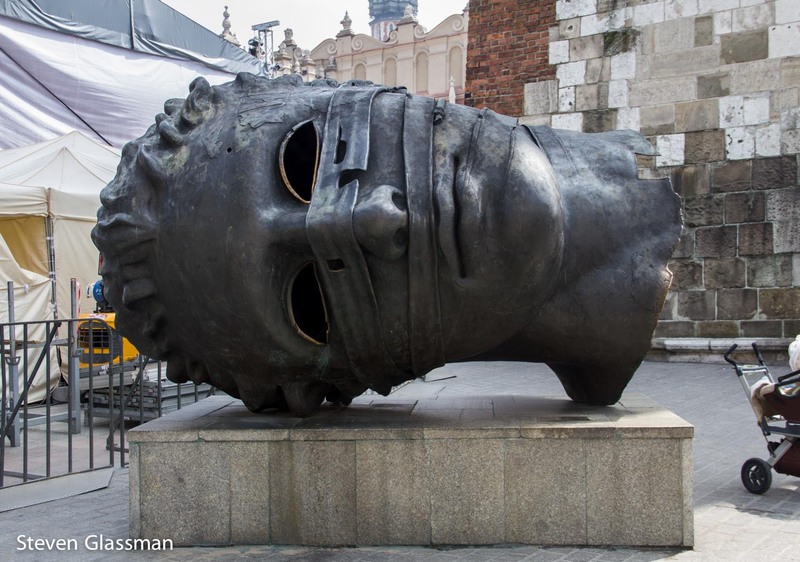 If I was going to visit Poland, I had to choose a city. 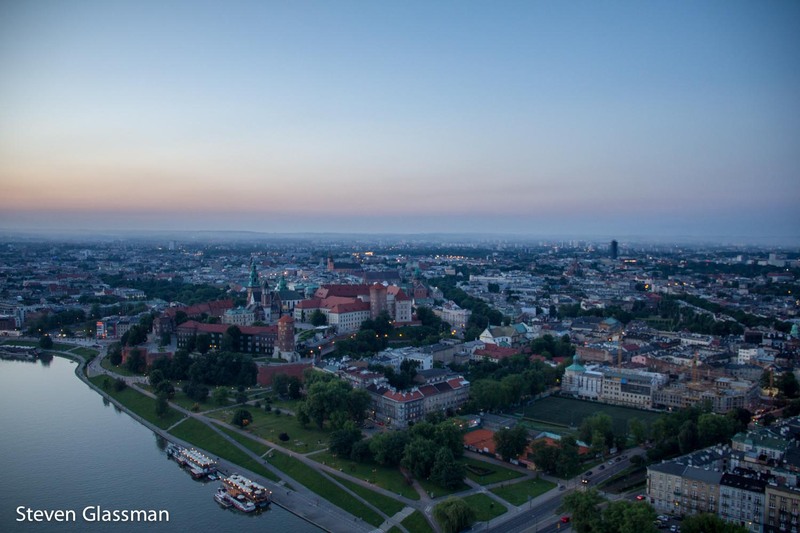 My top two choices were Krakow and Warsaw, and everything I had read indicated that Warsaw wasn’t all that different from any other major city. 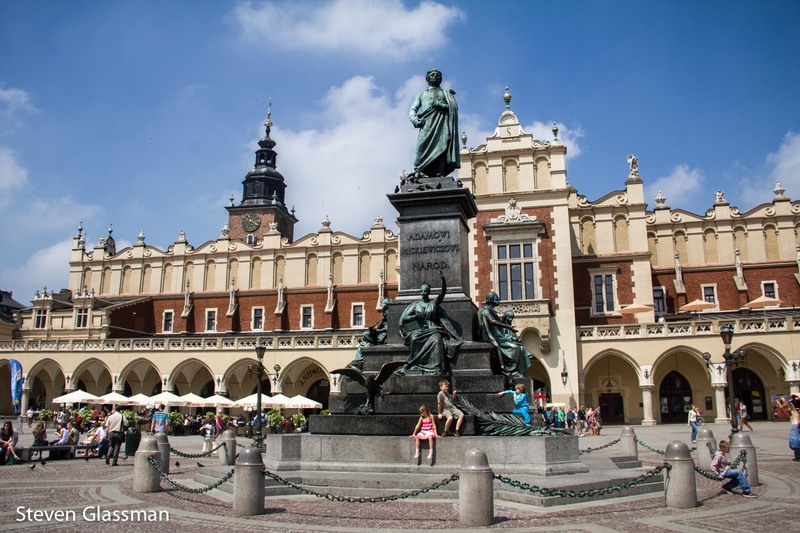 Off to Krakow I went! My hotel was only two short blocks from the Main Market Square. 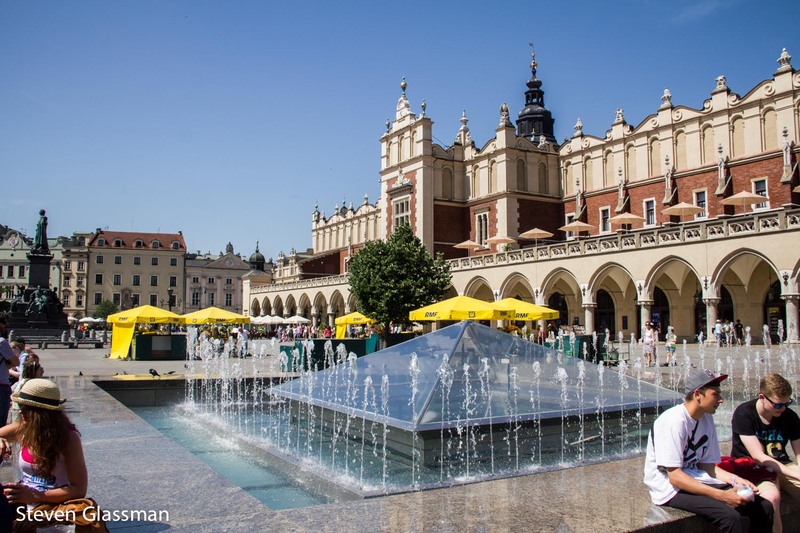 This is the largest medieval European square, covering roughly 40,000 square meters. Plus, it has a giant head. Not pictured: Me, re-enacting that scene from Clash of the Titans. 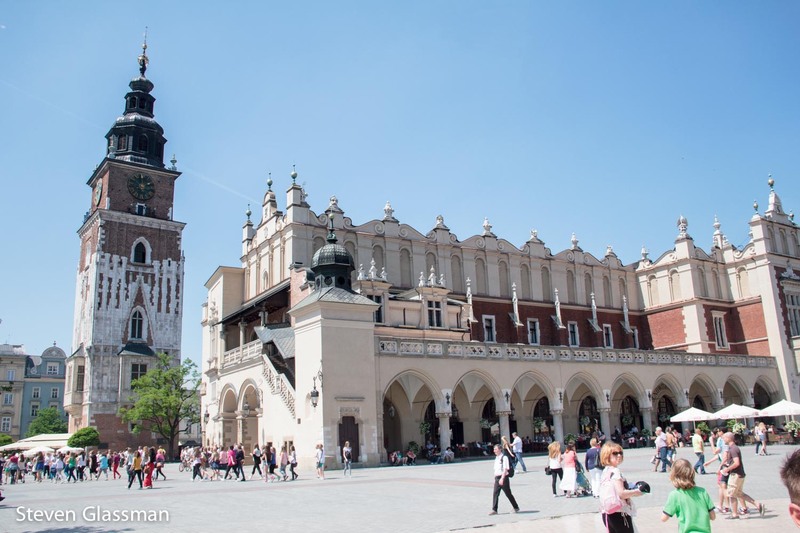 In the middle of the Market Square is a building called the Cloth Hall. 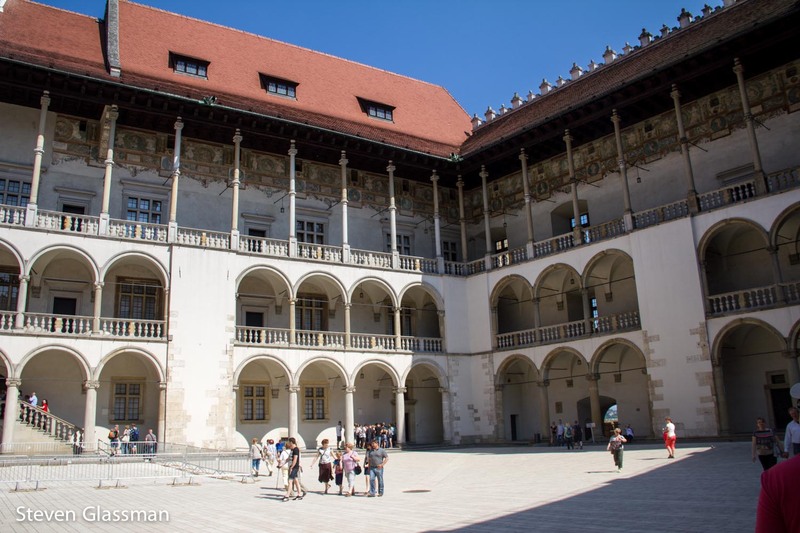 The original structure dates back to the 13th century, but it was rebuilt in the 16th century after the previous iteration was destroyed by fire. 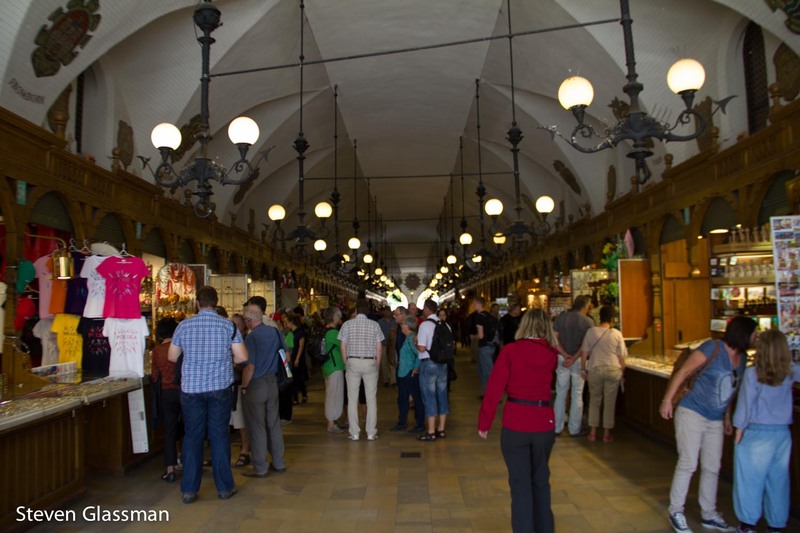 Inside the cloth hall are rows of merchants, mostly selling to tourists. 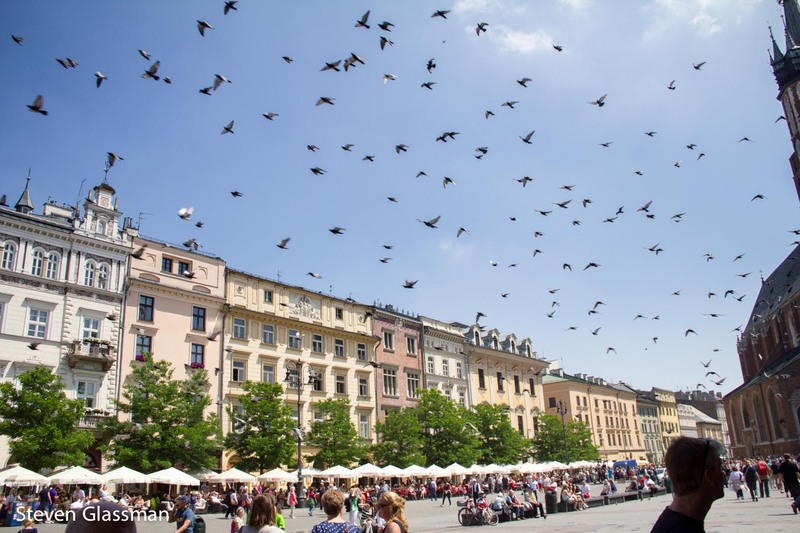 The Market Square has a ton of pigeons. They were creepy as hell. One more view of the Cloth Hall, this time from the back and with a nifty fountain in view. This is a slightly different view of the same building. This view shows the Town Hall tower, which you can climb. If you should choose to climb it, be aware that the steps in this tower are very tall steps, and the passageway is very narrow. Good view from the top, though. The old town hall’s tower is still standing, even though the rest of the town hall is gone. 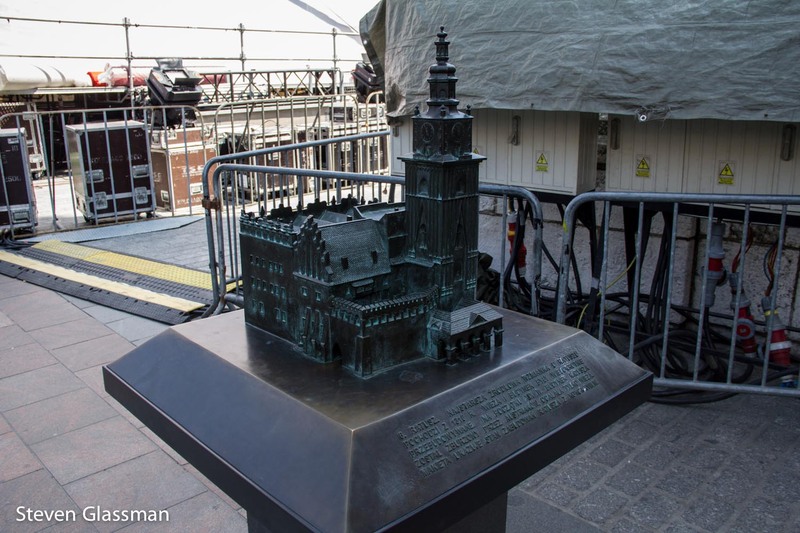 There’s a brass sculpture next to the tower showing what the original structure looked like. 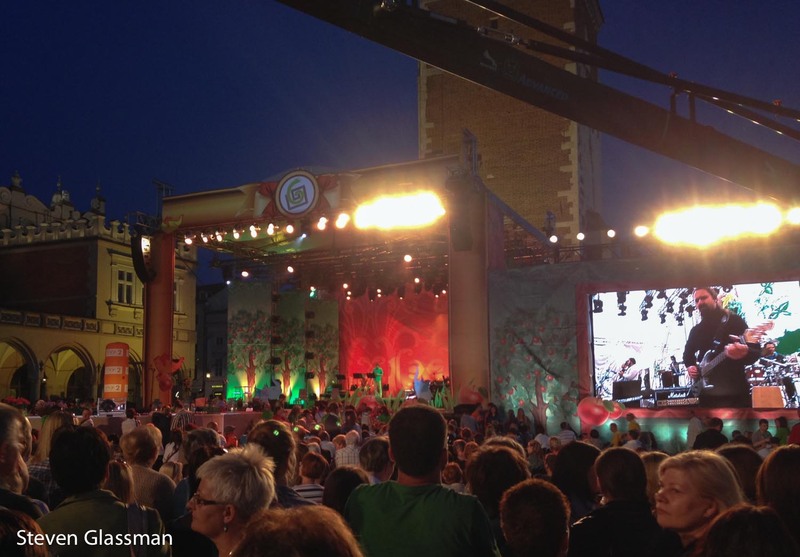 All the extra crap in that last picture is because there was an enormous stage set up in the Square for some big event while I was there. Lots of live music, some of which was even good. Pick one and follow them. They cover a lot of interesting topics. 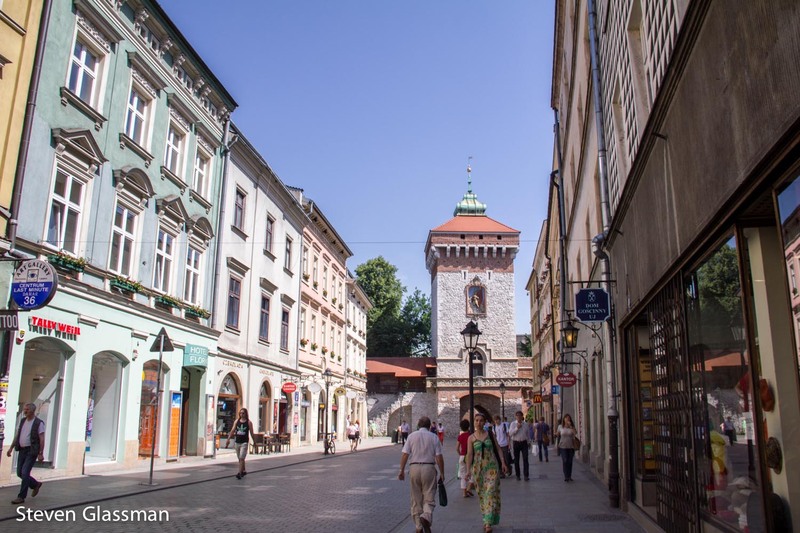 Most of the free tours will lead you down this street, past the McDonald’s and toward St. Florian’s Gate. 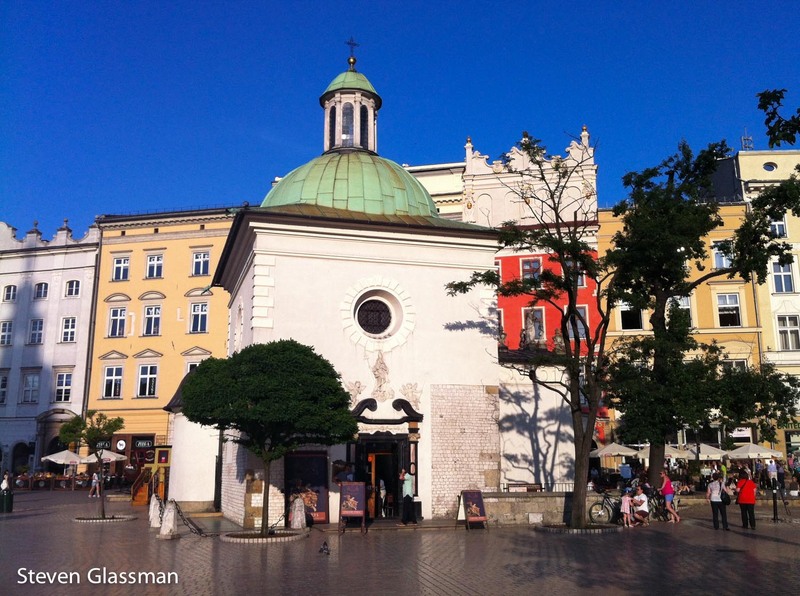 St. Florian’s Gate is part of the city’s defensive walls from the 13th century. There used to be a moat, but that’s gone now. 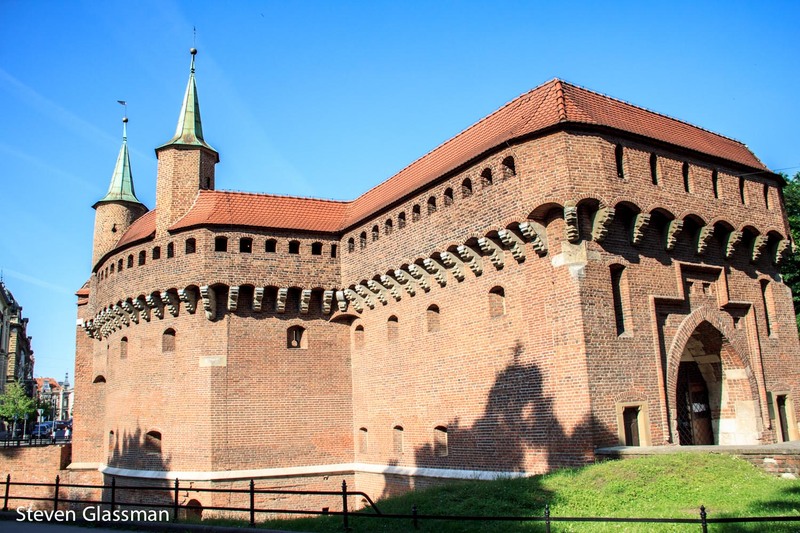 There were originally 47 observation towers and seven gates, because Krakow was a medieval fortress at the time. Near the gate is this excellent statue of Jay Garrick the Roman god Mercury. Through the gate is the Barbican, a circular fortification which was originally connected to the main gate. Barbican is not the name of the building, it’s the name of the type of structure- but I don’t think the locals call it by another name. Let’s go back to the Market Square, because I’m not done there. In one corner is this pretty nifty church, the Church of St. Mary, sometimes referred to as St. Mary’s Basilica. The church is not parallel to the square, and the towers are not uniform. The reason for the different towers is that the smaller tower is a bell tower, and the higher tower has always belonged to the city and was used as a watchtower. 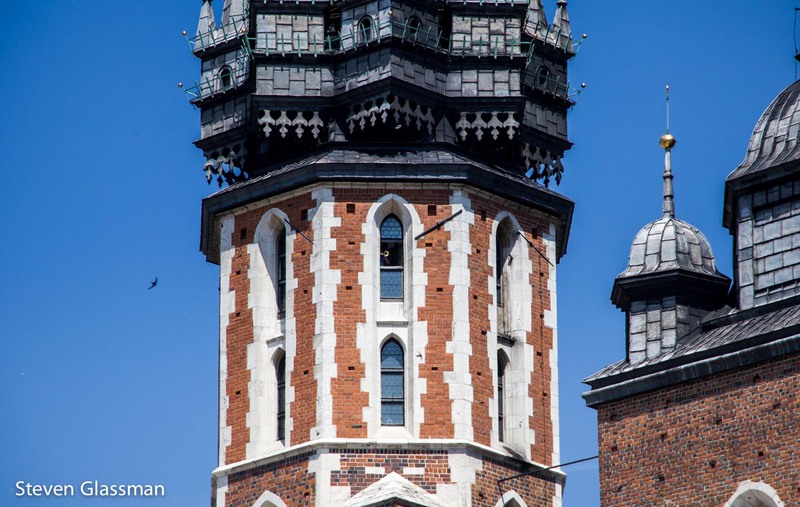 Every hour, on the hour, a small window is opened in the watchtower, and a short trumpet signal called the Hejnał mariacki is played. The trumpeter then opens a different window and repeats the call. 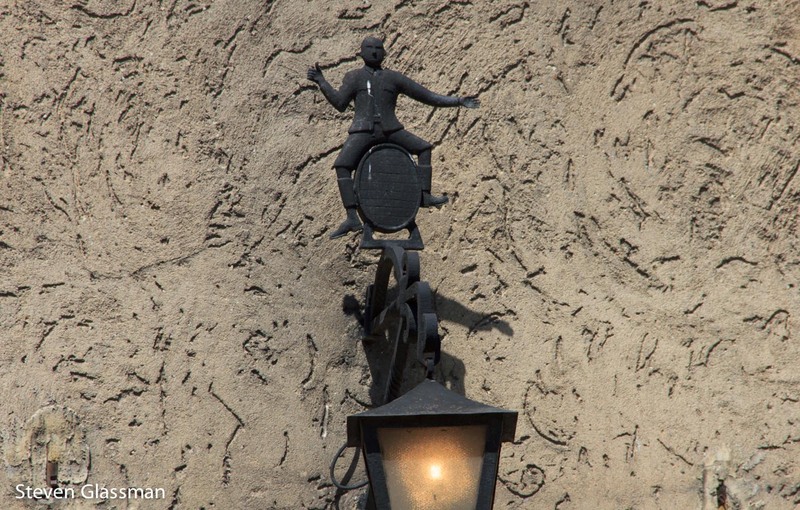 This is done four times in all, in four directions which roughly correspond to the direction of the four main Krakow city gates. The tune breaks off very abruptly. It is not known with certainty why this is so, but one of the most persistent legends is that it is cut off to commemorate a 13th century trumpeter who was shot in the throat while sounding the alarm before a Mongol attack on the city. Here’s a short video of the trumpet signal. 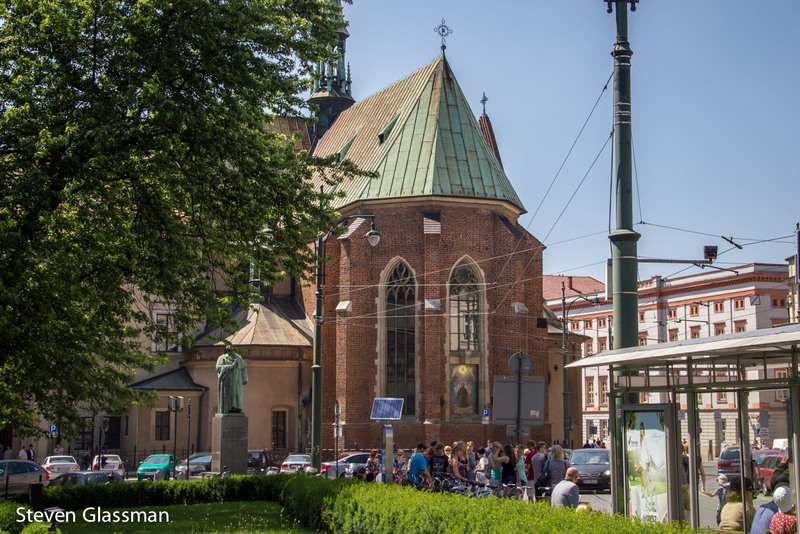 In another corner of the Market Square is another amazing (but much, much smaller) church called St. Adalbert’s Church. Legend says this is the location where St. Adalbert used to preach. 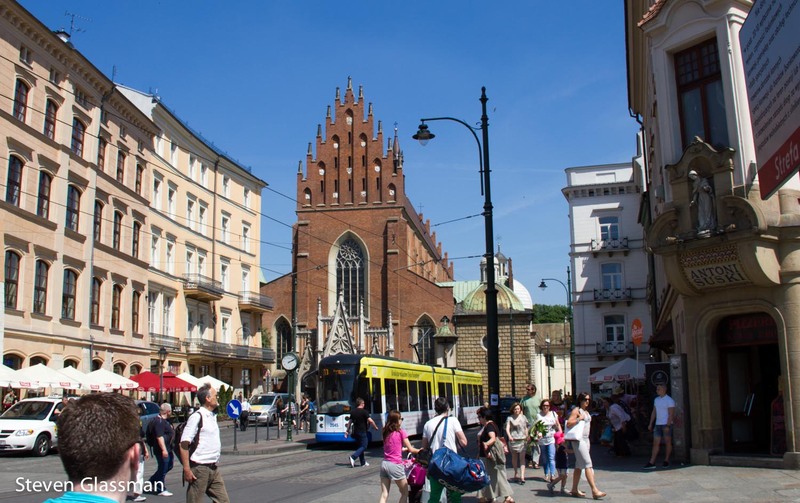 Walking south out of the main Market Square, along Grodzka, you eventually come to an intersection with two more interesting churches visible. I can’t remember the name of this one. This one is the Church of St. Francis of Assisi, the Franciscan church. 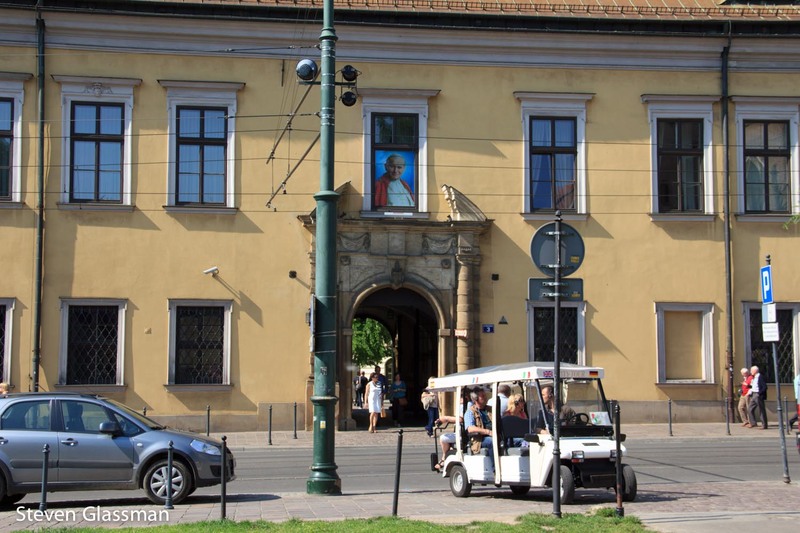 Across the street from the Franciscan church is the Bishop’s Palace, where Pope John Paul II stayed whenever he was in the city. They even decked out the window he used to hang out of to permanently commemorate this. 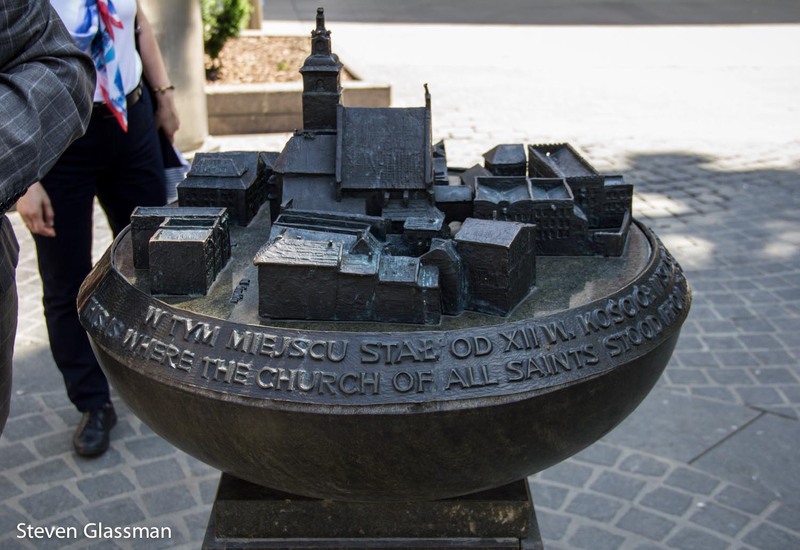 Between the two churches is another interesting sculpture showing where the Church of All Saints stood in the past. At this point in the post, the “walking around the city” narrative sort of breaks down, because the last few pictures aren’t in a straight line. For example, this is the former Collegium Physicum, the location for the faculties of pharmacology, physiology, physics, chemistry, and geology. Lots of science was done here. 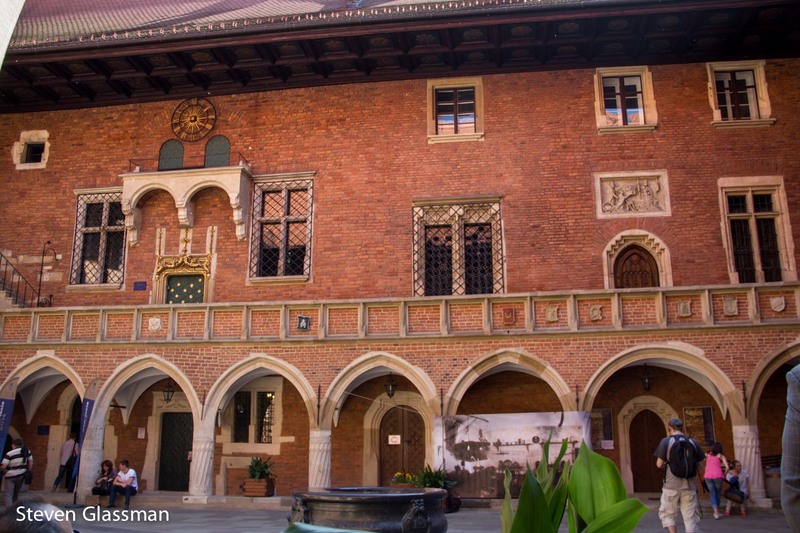 …and this is the Collegium Maius, the oldest existing building of the Jagiellonian University. I didn’t get to see that wonderful clock in motion, but my city map said it runs at 11am, 1pm, and 3pm every day. 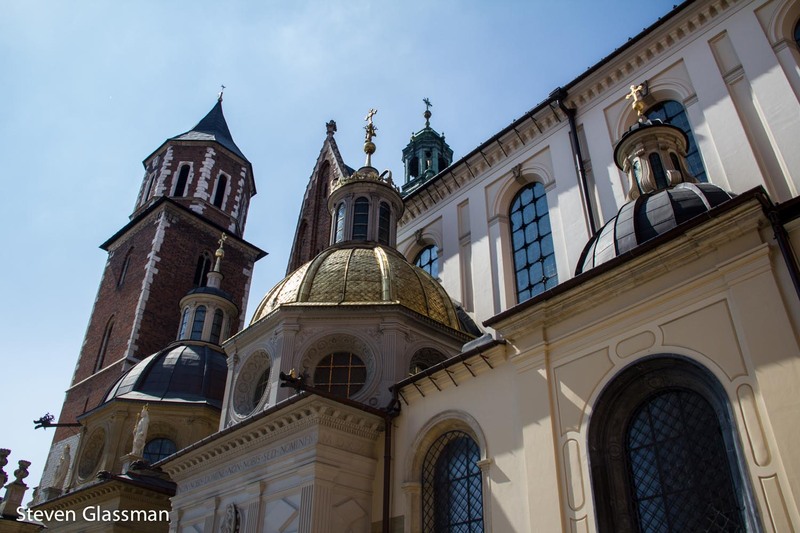 This the real gold roof of the cathedral on Wawel Hill, near the castle. It’s plated though, and not solid gold, because that would be too heavy. I took a brief stop in Wawal Castle to view Leonardo da Vinci’s Lady with an Ermine. It was smaller than I expected. The classics almost always are. Alas, photographs were forbidden. After I was done looking at the painting, I noticed this fascinating giant balloon from the courtyard. This is the Hiflyer. 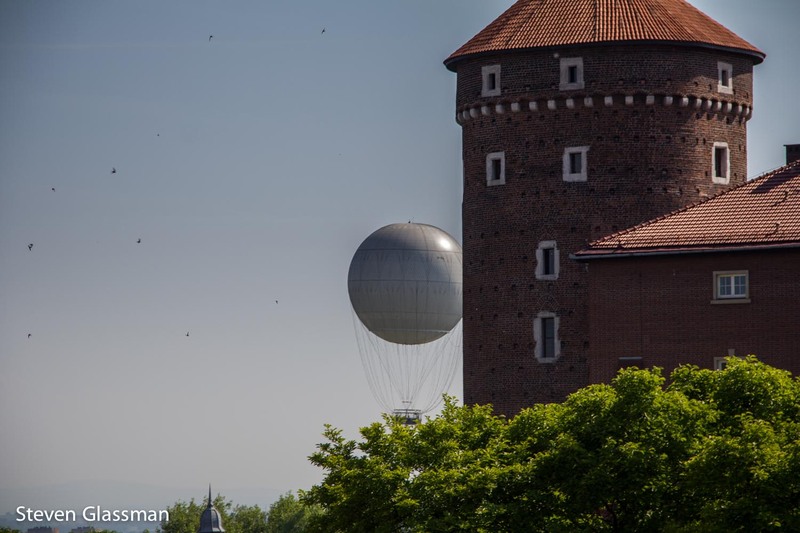 It’s based a reasonable walk from the city center, and as long as the weather is good, they’re flying. They recommend calling ahead just to be sure, but a reservation isn’t necessary. 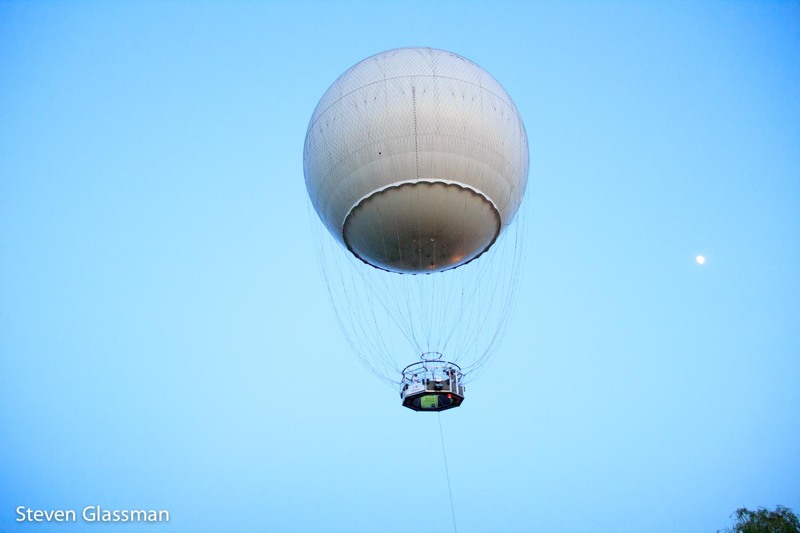 The balloon is more or less stationary, because it’s tethered to a single place on the ground. The “basket” for this is actually a very large metal ring, with an open center for the cable that pulls you back down at the end of your flight. Going up at dusk affords you some pretty spectacular views of the area. 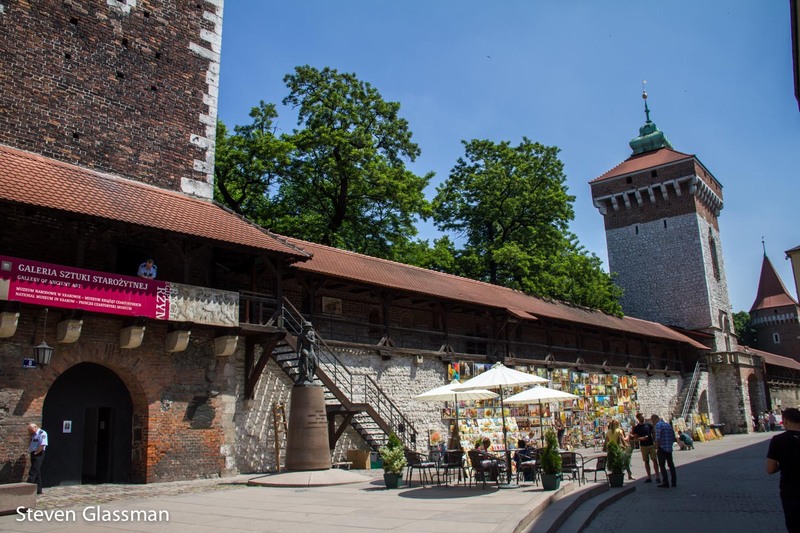 This direction shows Wawel Hill, including the castle. On my last evening in town, I stopped at one of the restaurants in the main market square and I had these fresh pierogies. 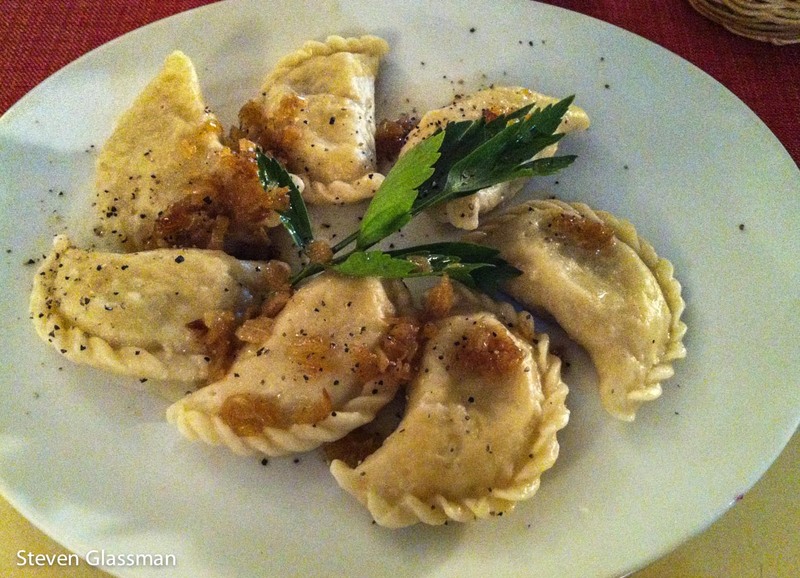 I love pierogies, and having a chance to have freshly made ones in Poland is not to be missed. These were so, so delicious. 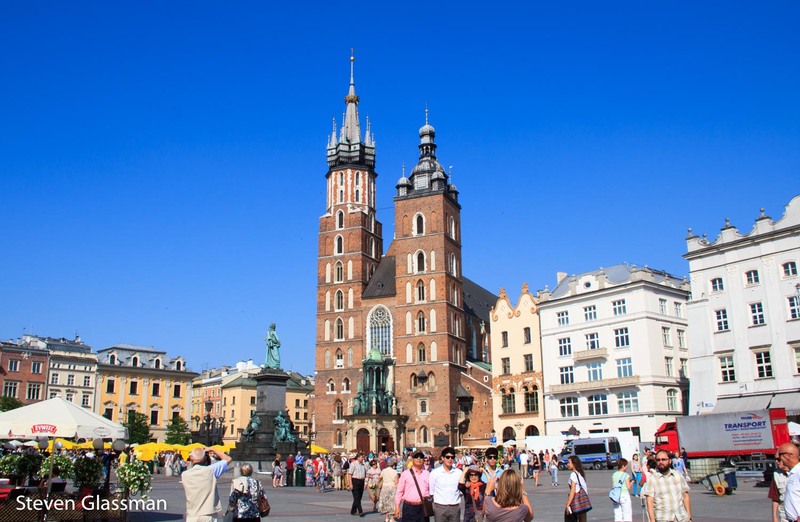 Have you ever been to Krakow? Have you ever had a pierogi?